If you peruse the lineup of speakers for the Center for Resilience’s inaugural conference and reception this October, you may be wondering what a licensed psychologist, a Rhode Island police chief, a Boston-based entrepreneur and an Academy-award winning filmmaker have in common. “Resilience in Action” on October 21st is the launch event and annual fundraiser for Center for Resilience, formerly ResilientKids. The conference, which is ideal for educators, parents, businesses considering launching workplace mindfulness programs, and community members who want to learn more about the benefits of mindfulness, will also provide multiple practice opportunities for all our attendees to experience short sessions of mindfulness throughout the afternoon that are designed for both first-timers as well as experienced practitioners. We hope many of you will stay with us for the evening, or join us after your work day, for a 5:30 p.m. reception, followed by a sit-down dinner and conversation with Oscar award-winning Screenwriter Josh Singer and one of the film’s lead supporting actor Neal Huff from the 2015 movie SPOTLIGHT. This powerful film brought the Catholic Church’s priest abuse crisis and Boston Globe Spotlight investigation to life. Over dinner, these artists will share with us this incredible story of resilience – not only of the resilience of the survivor community in Boston, but also how their own mindfulness practice helped them throughout the making of the movie. There will be plenty of time for Q&A and even pictures with the Oscar. This special event serves as both the formal introduction of the expanded Center for Resilience as well as our biggest fundraiser of the year. Proceeds support our five-year-old ResilientKids program, which delivers mindfulness to several of Rhode Island’s highest-need urban schools. We hope you will join us for all or part of the event to learn more about mindfulness, enhance your own practice and support this great cause. Center for Resilience, a 501(c)3 nonprofit organization, is dedicated to empowering people to empower themselves through the practice of mindfulness, which fosters success in the classroom, community and workplace. Our trained staff, tailored curriculum, interactive workshops and online resources help children and adults manage stress, overcome obstacles, cultivate compassion and thrive through adversity – outcomes that benefit both the individual and society as a whole. 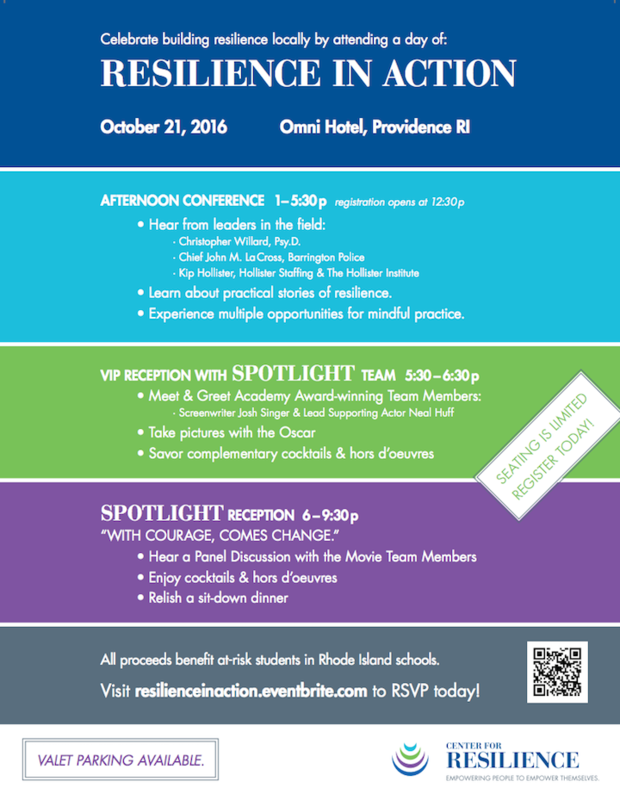 All proceeds from this event will support the building of resilience in RI schoolchildren through our school-based ResilientKids program.